The Pathfinder 32" rolling drop bottom duffel is built from water resistant, honeycomb-patterned padded 1680D ripstop and features a zippered main compartment with two elastic pouches and two zippered mesh pockets. There is a zippered drop bottom storage compartment with compression straps, and the zippered separation flap for the drop bottom has elastic straps to keep it open. The two sections open completely with the center zipper. The gusseted zippered front pocket has an interior mesh pocket, swivel lobster clip and exterior zippered pocket. 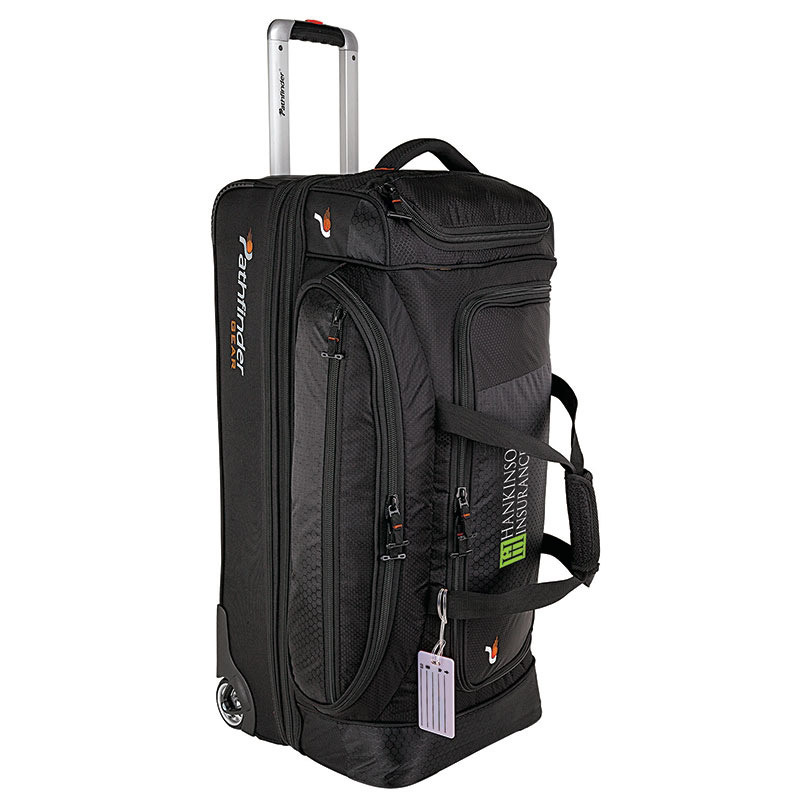 The exterior features a zippered top pocket, 42" locking telescopic handle, padded top handle, convenient bottom handle, heavy-duty 3 1/4" wheels, hook and loop ID flap, carry strap handle with hook and loop pad, 2" zippered expansion, and oversized self-repairing coil zippers with T-bar pulls. Decoration Information - Your artwork is sewn into the garment by a computer controlled machine. Prices include 1 location with up to 7,000 stitches.